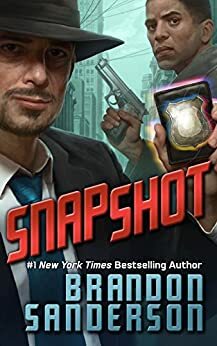 Snapshot is the latest sci-fi detective short story by Brandon Sanderson. How it works is a “snapshot” is a recreation of a day in an underground facility that is built to the exact atom of everything that took place during that time. The main characters Chaz (Hey that’s me!) and Davis are real world detectives that are allowed to enter this “simulation” to investigate. This is a very cool premise and a lot can be done with it. While reading I had to stop and think about what I would do if I had a free pass to do whatever I wanted in a fake (real) world. All of the people that are simulated in the snapshot are exact copies of their real life counterparts on that day. They all believe that they are actually the real ones and not the ones in a snapshot. If they are exact copies down to the atom doesn’t that make them just as real though? (That’s a question for Neil Degrasse Tyson I guess…) The cool concept that is added into this are deviations. These are the little things that Chaz and Davis do during the snapshot that did not happen during the day that was recreated, and that will change the world around them. It is very much the butterfly effect which is fascinating enough on its own. I love how sci-fi can take concepts like this and throw them into an great story that entertains you and at the same time makes you think. I enjoy how Sanderson writes his detective mysteries and I can see that he enjoys it too. You can see some of this bleed into all of his works as well, so it is nice to see a story devoted to it with some awesome sci-fi thrown in too. Chaz and Davis get pretty good character development for the short amount of pages that Sanderson used. They do not feel flat to me at all. I usually feel that the detective shtick can be pretty cliche and boring sometimes, and I did not get that reading this story. The pages fly by and before you know it, the story is over. The ending is worth the few dollars it costs alone. I would like to see more stories that have these same elements and premise in the future. If you know anything like it that I would enjoy, let me know!